Law Firms – Does Size Matter? Small law firms usually do their advertising by word-of-mouth, relying on clients to tell friends and family that they were well represented by a one, two, or three attorney law practice. Which is better? The answer is both. The legal profession is and has always been about the confidential relationship between a client and an attorney. The concept of attorney-client privilege is defined as a US-American legal concept that protects certain communications between a client and his or her attorney and prevents the attorney from being compelled to testify to those communications in court. What’s really important is the relationship as it pertains to an attorney’s commitment to remain understanding and responsive to a client during a very trying time. 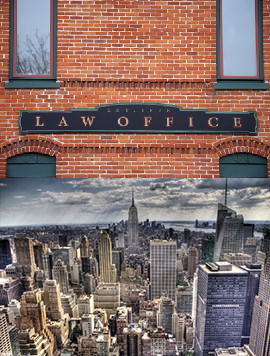 An attorney who is dedicated to addressing client fears and concerns and who always places the client’s rights and best interest first will serve that client well from a desk in a small office on Main Street or from a desk in the office of a 500-member firm in a big city. The Law Firm of Lazarus and Lazarus was founded by law partners Gary and Arleen Lazarus. Their belief is that with their unique skills, experience, and personalities they can best serve their clients as a small, family firm. And so for 25 years they have represented clients, mostly from south Florida, in personal injury cases from their offices in Fort Lauderdale and Weston. The Firm has also chosen some very specialized areas of law to focus on, to the point where they are among a handful of attorneys known for their pre-eminent knowledge and experience in these fields. You would think that Maritime Law would be a common area for attorneys in Florida because the state is surrounded by water and the number of boats and vessels. But it is actually a very complex area because of the international implications and various jurisdictions involved. Pharmacy errors and negligence is another facet of the Lazarus Law Firm’s expertise and once again it involves very specialized knowledge. Pharmaceutical products available to patients have skyrocketed, and their proliferation is resulting in too many accidents and cases of pharmacy and physician errors. Gary and Arleen are dedicated to helping people who, through no fault of their own, are becoming victims of medicine that was supposed to help them. Auto accidents kill and injure thousands of people each year, and the firm has always been at the forefront of handling cases for victims in south Florida. These cases require knowledge of laws pertaining to liability, medical costs, traffic statutes, and they require a real sense of compassion for people suffering devastating loss. Calling 954-356-0006 will put in direct contact with Gary and Arleen who are always ready to schedule a confidential consultation and help.